Brisk Anthem - ""O give thanks unto the Lord"
Easter Hymn - "Jesus Christ is ris'n today"
Apleton - J.Stephenson "If angels sung a saviour's birth"
Lonsdale - (Corelli) "Blest are the sons of peace"
Christmas Hymn - "Arise and hail this happy day"
Joy to the World - Thomas Shoel "Joy to the world, the Lord is come"
The CD can be obtained by sending a cheque for £10.50, made out to 'The Gladly Solemn Sound', Paul Guppy, Paul Guppy Music Repairs, 5 Albion Mews, De Vitre Street, Lancaster, LA1 3GE. Charles Dickens began A Christmas Carol with the statement 'Marley was dead', an assertion which he repeated four times in the first four paragraphs of the first stave (as he called them) of the book. He had no choice but to do so, the point of attack of the book is the appearance to Ebenezer Scrooge of his old partner as a ghost and for sake of the plot he has quickly to establish in the mind of his reader the fact of Marley's death. It requires what has come to be called in recent years 'a suspension of disbelief' and Dickens was a master of the art. On listening for the first time to 'Repeat Their Sounding Joy' it is hard to believe that 'The Gladly Solemn Sound' is at all an amateur choir. Over the first few minutes of listening to this new recording I was forced to remind myself of that fact and, just like Dickens, I felt constrained to repeat it three times more, for good measure. Though it may not sound like it, this is the frst CD from the Lancaster quire and it reflects a light much too long hidden. They have obviously worked long and hard to achieve this standard of recording. The liner notes (by Paul Guppy, the director of The Gladly Solemn Sound) are a delight. and the list of pieces is comprehensively indexed by source, (with separate notes) by psalm number and by version. Almost all of us who listen to this kind of music these days want to know all there is to know about each piece and many will appreciate the fact that the liner is actually a small booklet which, in addition to all the details already mentioned, contains the words to each piece. When the swell-pedal appears it is there in full vigour. (as Scrooge said of the treadmill!) and it is heard at its best in the 'Brisk Anthem' and in the 'Easter Hymn' that follows it. I defy your spine not to tingle when, after an introductory phrase in the bass and tenor, all four voices suddenly pour a tumbling stream of 'Hallelujahs' into the Easter Hymn. It had me reaching for the replay button again and again and again. It is excellently recorded throughout so the treble 'dominance' which I detect can be due only to one of two factors, the relatively low number of male voices among the tenors or the strength of the voices in the treble part, and not to any ignorance on the part of the recording engineer as to the voice in which the air lies. To have voices of this quality and confidence in the treble part is anyway great good fortune; the last 'Amen' of the Brisk Anthem begs them to fail, but they succeed triumphantly doubling the top A of the altos and holding it as long as the music allows. They sing much of the piece in the top half of their range and show little by the way of wear and tear at the end. It is glorious music, and I would almost buy the CD for this piece alone. I really like the string band that accompanies The Gladly Solemn Sound. 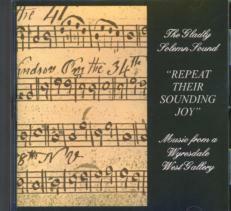 They appear first on track three, the Sunderland tune, where they play a deliberately vibrato-less, trilling style appropriate for the music and the period, and later, as a symphony to Lonsdale , they achieve so much of a light touch, a Quadrille-band style of playing, that one might wonder if there is not a tongue firmly in a cheek somewhere. There isn't, of course, though those who profess to be knowledgeable about the instrumental music of this period will curl their lip in sardonic appreciation of their apparent musical witticism like Mozart's deliberate musical joke, they simply play, as it were, the period before the period before which, by all contemporary accounts, is just what the composer and players of this kind of church music did. There will be those for whom (and I have to count myself in that number) this recording will feel slightly over-finished. There are few decorations from the singers. (I felt the lack af them particularly on track six (the funeral hymn), few passing-notes and no 'twiddles' at cadences. They do seem to sing without restraint at times, but this seems to be the dynamic variation to which the liner notes refer rather than any free hand with the dots. There is a tight rein behind them somewhere but, as it is one which has produced this striking level of performance, it will be easily indulged. This is a recording in which there are delightful surprises, none of which (I very much hope) I have spoiled in the necessary description and in which there are renditions of 'standard' pieces which are at one and the same time refreshing demanding and inspiring. It is a more than worthy addition to the canon: buy it while you can.